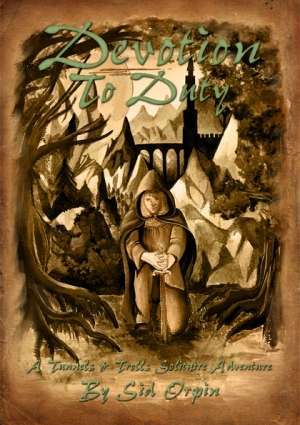 Devotion to Duty is a mini solitaire adventure for use with the Tunnels & Trolls™ role-playing system created by Ken St.Andre. It has been designed for use with version 7.5 of the rules but could easily be adapted for use with earlier editions. Within its 90 adventure paragraphs you take on the persona of a novice of the great Goddess Hoepht in their struggle to pass the trials of progression. Succeed and you will become an initiate of your deity, fail and you will be cast back into the secular world from which you came. This adventure is for a single, newly created, first level, humanoid character. Warriors are perhaps best suited to the rigours of the trials but a paragon or rogue might attempt it, though there is no facility for them to employ magic. This title was added to our catalog on December 18, 2011.